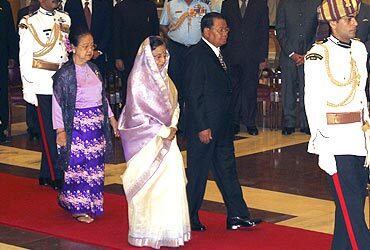 Myanmar's notorious dictator General Than Shwe, who is on a five-day official visit to India, met President Pratibha Patil on Tuesday. Shwe, along with his wife Daw Kyaing Kyaing, was accorded a ceremonial reception at the presidential palace in New Delhi. 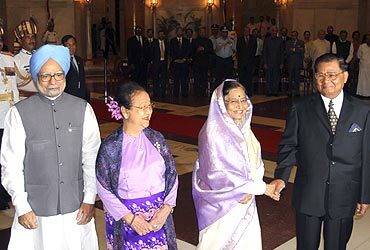 Shwe also met Prime Minister Manmohan Singh and External Affairs Minister S M Krishna at the Rashtrapati Bhavan event. The two leaders are scheduled to hold talks later. The dictator also visited Raj Ghat, the memorial of Mahatma Gandhi, and paid tribute to the Father of the Nation. According to sources, India and Myanmar are set to ink a treaty on mutual legal assistance in criminal matters to combat transnational organised crime, terrorism, drug trafficking, money laundering and smuggling of arms and explosives. A slew of pacts on boosting Indian investment in the energy, transport and infrastructure sectors is also expected to be signed after delegation-level talks. Shwe is also expected to seek India's help to restore the famous Buddhist pagoda, Ananda Temple, in Myanmar. General Than Shwe had arrived in India on Monday. He paid obeisance at the Bodhgaya temple in Bihar before proceeding to the national capital. The General offered prayers and attended a programme in Gaya and Sarnath before leaving for Delhi. Wary of the growing influence of China in Myanmar, India has in the last few years stepped up its diplomatic efforts to forge better ties with the nation ruled by the ruthless Junta. Myanmar also borders several north-eastern states, and India is planning an ambitious trade route to a port in Myanmar for these landlocked regions. With an eye on Myanmar's rich reserves of gas and fuel, the Indian government has toned down its vocal support to pro-democracy icon Aun Sung Suu Kyi. Suu Kyi has been put under various forms of detention by the Junta for speaking up against the cruel regime and demanding elections in the impoverished country. The United States, one of the military Junta's most outspoken critics, has urged India to bring up the issues of democratic reforms and persecution of ethnic minorities in the country. Meanwhile, Delhi witnessed demonstrations by pro-democracy activists against the General's visit. 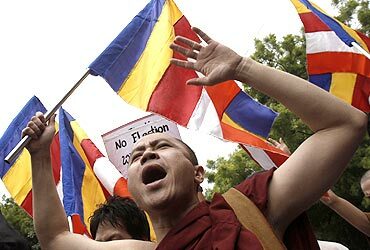 The protestors shouted slogans against Than Shwe and burnt his effigies.